You Save: $20.00 (80%) Ships in 1 day. Soft Cover, 184 pages, 8.5 x 10.25. 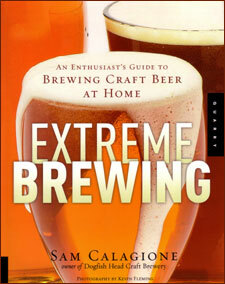 Extreme Brewing is a recipe-driven resource for aspiring home brewers who are interested in recreating these specialty beers at home, but don't have the time to learn the in-depth science and lore behind home-brewing. As such, all recipes are malt-syrup based (the simplest brewing method) with variations for partial-grain brewing. While recipes are included for classic beer styles -- ales and lagers -- Extreme Brewing has a unique emphasis on hybrid styles that use fruit, vegetables, herbs and spices to create unique flavor combinations. Once their brew is complete, readers can turn to section three, The Rewards of Your Labor, to receive guidance on presentation, including corking, bottle selection and labeling as well as detailed information on food pairings, including recipes for beer infused dishes and fun ideas for themed dinners that tallow the reader to share their creations with family and friends. Extreme Brewing uses ingredients above and beyond the standard four -- barley, hops, water and yeast -- and includes fruits, vegetables, herbs and spices to create unique flavor combinations. With the publication of Extreme Brewing, epicureans interested in home brewing no longer have to rely on old fashioned text-like books to glean their knowledge about home brewing. Step-by-step instructions and full-color photography guarantee the perfect batch every time. About the author -- Sam Calagione is the founder and owner of Dogfish Head Craft Brewery in Milton, DE, the nation's fastest growing independent brewery, and Dogfish Head Brewery, and Eats in Rehoboth Beach, DE. His innovative style has earned him a reputation as one of America's most adventurous entrepreneurs and brewers. He is the author of Brewing Up A Business: Adventures in Entrepreneurship from the Founder of the Dogfish Head Craft Brewery.